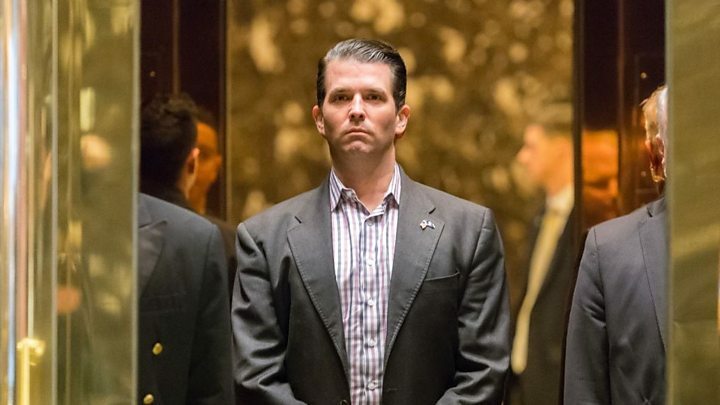 Mr Cohen suggests the president had advance knowledge of his son's June 2016 Trump Tower meeting with Russians and that WikiLeaks was poised to release damaging information about Democrats. He says the president personally signed cheques reimbursing him for a hush money payment to adult film star Stormy Daniels. He alleges that the president was fully aware of ongoing negotiations for a Trump Tower in Moscow well into the 2016 presidential campaign. Many of these assertions rely almost exclusively on Cohen's word - the word of a man who has already admitted to lying to Congress and to the federal government on his taxes. What's more, while his allegations are certainly politically damaging, they aren't incontrovertible evidence of legal misconduct by the president. If there is a case to be made against Mr Trump, it will have to rely on more than the word of his former lawyer and fixer. That's not to undersell the blockbuster nature of the day's proceedings, however. The public now has a chance to determine, under the glare of the spotlight, whether Cohen lied in the past to protect the president or is lying now to protect himself. Or, perhaps, a bit of both. Most of the early attention paid to Michael Cohen's testimony involved his connections to the assortment of controversies that have swirled around Mr Trump since he became president. It's one thing to read the advance text of a committee statement, however, and it's another to see it in the flesh. If there were any doubts about how effective Cohen would be as a witness, he quickly put them to rest. Cohen - in a dark suit, with his voice occasionally wavering - testified about what it was like to work with Mr Trump for more than a decade. What he learned, he said, made him ashamed. He called his former boss a racist, a cheat and a conman. He says he had both good and bad attributes, but that bad outweighed the good. "Since taking office," Cohen said, "he has become the worst version of himself." Republicans were quick to pounce. Mark Meadows asked why, if Cohen was so ashamed, he stuck with Mr Trump for 10 full years. Wasn't it a possibility, he suggested, that Cohen was bitter that he didn't get a White House job and was taking it out on his former boss? "I got exactly what I wanted," Cohen replied, noting that he preferred to spend his time in New York, with his teenage children. 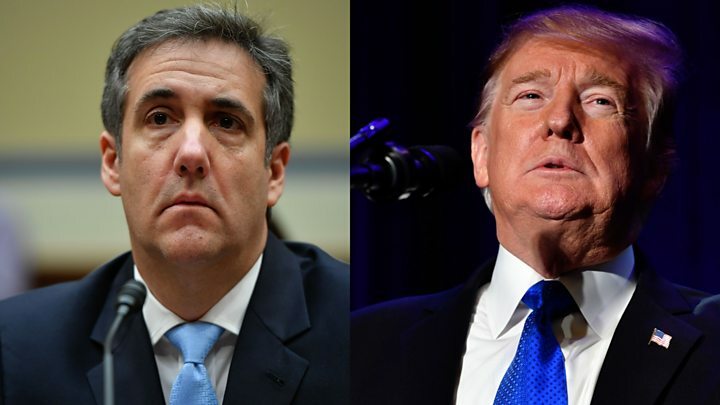 That may have been the case two years ago, but there's little chance Cohen wanted - or imagined - the situation he finds himself in now. Democrats on the House Oversight and Reform Committee have repeatedly hit on what could be the most legally damaging part of Cohen's testimony on Wednesday. Mr Trump's former lawyer has presented new, documentary evidence of payments made to him by Mr Trump - including a cheque with the president's signature. He says this money was a reimbursement for his 2016 election eve hush-money payment to Stormy Daniels. The adult film star was poised to claim that she and Mr Trump had sexual relations in the 2006. US government prosecutors in New York have said that Mr Cohen's payment to Daniels constituted an undisclosed campaign contribution in violation of federal election law - a charge to which Cohen has pleaded guilty. If Cohen can help draw a connection between the Daniels payment and the president himself, it could implicate Mr Trump in a crime. The president's legal team has responded to similar allegations in the past by arguing that the payments to Cohen were part of a retainer fee and that Mr Trump had no knowledge of Cohen's illegal activities and was relying on his lawyer to know and abide by campaign finance law. The more evidence Cohen presents to back up his claim that Mr Trump was fully aware of the hush-money payments, the more difficult it becomes for him to maintain this position. The Republican strategy for responding to Cohen's testimony has been clear from the beginning. They want to paint the former lawyer as a convicted liar who can't be trusted on any count. They're less concerned about rebutting the individual allegations - about Trump Tower, Russia business dealings, hush-money payments or WikiLeaks revelations - than they are in dismissing Cohen's testimony as the work of an untruthful man being put forward by enemies of the president for political purposes. Congressman Paul Gosar went so far as to hold up a large sign with "Liar, Liar, Pants on Fire!!" emblazoned over a picture of the witness. Cohen has tried to parry these charges multiple ways. One is to claim that he has come to the realisation, after Mr Trump's performance as president, of how damaging his support of his former boss has been. He cited the Charlottesville violence, the Helsinki summit with Vladimir Putin and the president's coarseness on Twitter as prime examples. That could be a tough sell, however, given the litany of allegations Cohen has levelled against Mr Trump that predate his time as president. A more effective counter has been when Cohen has tried to hold himself up as a cautionary tale - that he is making amends because his life has come crashing down and not the other way around. "I protected Trump for 10 years," he told the committee. "The more people that follow Mr Trump as I did blindly are going to suffer the same consequences that I'm suffering." He called himself the "picture perfect example of what not to do". Cohen isn't going to convince many that he's a saint or a sympathetic figure. When he's been his most effective on Wednesday is when he hasn't tried to. Donald Trump wrapped up his day in Vietnam around the time Cohen began his congressional committee testimony. After a lavish dinner of chilled shrimp, grilled steaks and "chocolate lava cake" with North Korean leader Kim Jong-un, he returned to his hotel room, where if past history is any guide, he probably reviewed the day's news coverage. What he saw couldn't have made him happy. US media - including his favourite, Fox News - are giving the Cohen hearings wall-to-wall coverage. The president's second summit with Mr Kim, being billed as "historic" by the White House, has been relegated to a secondary story. That might change on Thursday, when the two leaders hold a joint press event where they could announce the results of their negotiations. But for one day at least his former lawyer - who he once said was a "fine man with a wonderful family" and later called a "rat" - held the national stage. Cohen has given Democrats on the Oversight and Reform Committee a number of threads to pursue in further hearings and investigations. It isn't a stretch to imagine that portions of his testimony could someday be cited by Democrats as evidence for impeachment hearings. In addition Cohen hinted at other potential presidential wrongdoing and illegalities - including a conversation with the president in June 2018 - that he couldn't discuss because they are currently being investigated by US attorneys in New York. The president is half a world away, but the fallout from Cohen's day on Capitol Hill - a day when Cohen called the president a racist, a conman and a cheat, and Republicans called Cohen a liar - will be waiting for him when he gets home.